Alzheimer’s disease is the most common form of dementia. It directly affects over 5.3 million Americans, most of whom are 65 years old or older. But the disease and its effects on loved ones affects millions more. The public health concern and financial impact of the disease on the nation are devastating. As most risk factors for Alzheimer’s (age, family history, and presence of certain genes) are not within a person’s control, the prospect of developing Alzheimer’s is daunting. 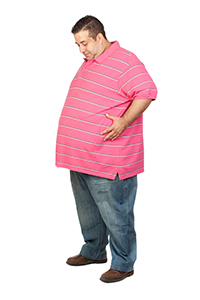 But, there is one potential risk factor that we can control: midlife obesity. Studies have linked midlife obesity with increased risk of Alzheimer’s disease. In order to understand the link between obesity and Alzheimer’s disease better, researchers at National Institute of Aging (NIA) studied nearly 1,400 cognitively normal participants in the Baltimore Longitudinal Study of Aging. The team assessed obesity at midlife (defined as 50 years old). They performed neurological assessments every 2 years for 14 years, during which time 142 participants developed Alzheimer’s disease. The researchers found that study participants who were overweight or obese (defined as having a BMI of 25 or higher) at the age of 50 developed Alzheimer’s 6.7 months earlier than those at a healthy weight. In addition, they found that as BMI increased, the risk of earlier onset of Alzheimer’s increased. The researchers also assessed autopsies of 191 deceased participants and found those with a high BMI were more likely to have amyloid proteins in their brain, one of the hallmark findings of Alzheimer’s disease. This finding was seen even in patients without Alzheimer’s disease. Researchers were unable to find a reason for the buildup of amyloid proteins or for earlier onset of Alzheimer’s with higher BMI, and note that further research is warranted. While researchers may not know the mechanisms, but they believe their findings highlight the importance of maintaining a healthy body weight for reducing the risk of earlier onset Alzheimer’s. They believe that if the trajectory of Alzheimer’s could be altered, the public health impact and financial impact could be reduced. Not to mention, it could potentially improve the lives of those affected by Alzheimer’s disease, both those who suffer from it and those who care for them. Dr. Shillingford and his staff enjoy sharing medical news and information that are significant to health and wellness, particularly as it relates to overweight and obesity. If you are considering bariatric weight loss surgery, call Dr. Shillingford, M.D., P.A. at (561) 483-8840 to schedule a free consultation at his Boca Raton office to discuss your surgical options. Dr. Shillingford is a board certified general surgeon specializing in gastric sleeve, gastric bypass, and adjustable lap band surgeries. His patients come from all over South Florida, including Palm Beach, Delray Beach, Wellington, Fort Lauderdale, Miami, and Miami Beach and as far north as Orlando and Jacksonville.